Six years after the first Army-branded game took the country by storm, the U.S. Army is ready to roll out sequel number two, announcing America's Army 3, due out later this year. So how does the U.S. Army make a sequel? "In AA3 we've taken all of the best features in AA2, incorporated feedback from the AA community and added the latest technology to develop a high-tech game that can be customized by the player to create a much more detailed interactive experience," said Michael Bode, executive producer of the America's Army game. By the book, that's how! Take what works, add in new stuff, and boom - America's Army 3. The new game will have a strong focus on training, Army values, and the Warrior Ethos, highlighting the Army lifestyle both on and off duty. 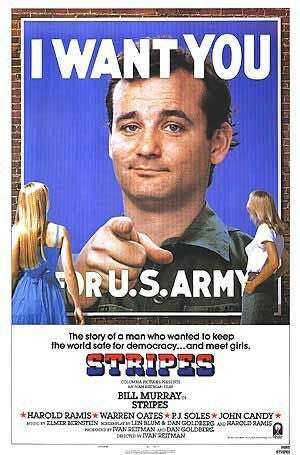 Sounds just like Stripes with Bill Murray! Where do I sign up? Silver Spring, MD January 20, 2009 - Six years after the U.S. Army revolutionized military action games with the launch of the free PC game America's Army, the U.S. Army today announced the upcoming release of America's Army 3 (AA3). America's Army 3 is the only free action game that delivers an authentic and entertaining Army experience by reflecting the training, technology, actions and career advancement of a Soldier within a unique exciting game experience. AA3, which will be rated T for Teen by the Entertainment Software Rating Board (ESRB), will be released in 2009. As with previous versions of America's Army, AA3 will be constantly updated to include new features and missions and to highlight new technologies being incorporated in today's Army. Using the state-of-the-art Unreal Engine 3, America's Army game developers brought the most popular trademark gameplay features from the previous versions to AA3. Highlights include authentic weapons and technologies, realistic training and exciting gameplay missions. AA3 provides players new insights into the Army and Soldiering while making the game easier to play, easier to install and easier to download. "In AA3 we've taken all of the best features in AA2, incorporated feedback from the AA community and added the latest technology to develop a high-tech game that can be customized by the player to create a much more detailed interactive experience," said Michael Bode, executive producer of the America's Army game. "One of our key design philosophies is to make the game easily accessible to a new player, while at the same time keeping a deeper layer of complexity for the more advanced players to discover and take advantage of." AA3 highlights different aspects of the Army from Army Values and the Warrior Ethos to Army career opportunities and lifestyles both on and off duty. Through their in-game characters, AA3 players will be able to experience the way Soldiers train, live, and advance in the Army. AA3 players will also experience different types of technologies and equipment used by the Army's high-tech Soldier. Players are bound by Rules of Engagement (ROE) and gain experience as they navigate challenges in team-based, multiplayer, force on force operations. In the game, as in the Army, accomplishing missions requires teamwork and adherence to the seven Army Core Values. In the game, a player's actions and demonstrated Army values will have consequences that are integral to success in gameplay and will affect a player's career progression. "With AA3, we're taking military gaming to an all new level where every detail counts," said Col. Casey Wardynski, originator and Director of the America's Army game project. "We want our America's Army 3 players to have a greater understanding of the Army and its values. Our Soldiers are aspirational figures and our players are able to virtually experience many aspects of a Soldier's life from their training, to their missions, to the way the Army has influenced their lives." As with the previous America's Army games, AA3's authenticity is second-to-none. Our Army development team worked closely with Subject Matter Experts from across the Army to make sure that everything about the game is as realistic as possible. AA3 has more authentic military elements including training, technology, weapons, and audio than any other military game. Built on Unreal Engine 3, AA3 delivers stunningly realistic environments, lighting effects, animations, and team-based experiences so that America's Army players can experience how the Army has strength like no other within its game that is like no other. AA3 players will have persistent characters that they customize by embarking on career paths in which they advance by completing specialized training and accomplishing missions. The evolution of the player's career follows the same progression as it would in the Army. Players are rewarded at significant milestones, such as graduation from basic training or returning from a deployment, through pride moments — vignettes represented visually as an achievement screen, movie or a slide show. These pride moments transition the player from one state of training or character progression to another. Initially, the core of the gameplay focuses on an Infantry Soldier (11B). Players can select from a variety of roles that the 11B performs such as Rifleman, Automatic Rifleman, Designated Marksman and Grenadier. The first additional Military Occupational Specialty (MOS) players can explore is 68W Health Care Specialist (Combat Medic) which will be added this summer. Players who complete advanced individual training modules can take on new MOS roles that will affect gameplay. For example, by completing medic training players will be able to treat minor and major injuries in single player training missions and render advanced medical aid in multiplayer missions. In subsequent game releases, players who complete Combat Engineer training will be able to assist in mission pre-planning, such as emplacing an obstacle to impede the mobility of enemy forces. Training is a key element in the AA3 game just as it is in the Army. The game offers a variety of new training levels that will give players an advantage in the game. After completing basic training players can go to advanced training to increase their in-game skill level and progress in their Army career. Success in the game earns players the privilege of taking specialized training. This specialized training allows players to unlock new abilities and gear, and to customize the gear they carry as well as their equipment loadout. As players advance, they will be able to 'cross-train' on many different MOSs available in today's Army. Such players will be highly sought after due to the capabilities they bring to multiplayer missions. Additionally, as a new feature, players will have the ability to join online games with limited capabilities using the "instant action" feature.